Let Us All Bask in Baby Luna’s First ChristmasJohn Legend and Chrissy Teigen’s child continues to make life worth living. John Legend Calls Kanye’s Meeting With Trump a Publicity StuntHe’s disappointed. 8 Best New Songs of the WeekJohn Legend and Donald Glover have gifted us with some late-year gems. The Celebrity Baby That’s Winning HalloweenSee all eight of Baby Luna’s costumes. 6 Best New Songs of the WeekLady Gaga and John Legend’s new single really tug at the heartstrings. Hear John Legend’s New Song, ‘Love Me Now’It’s the first single from his follow-up to 2013’s Love in the Future. 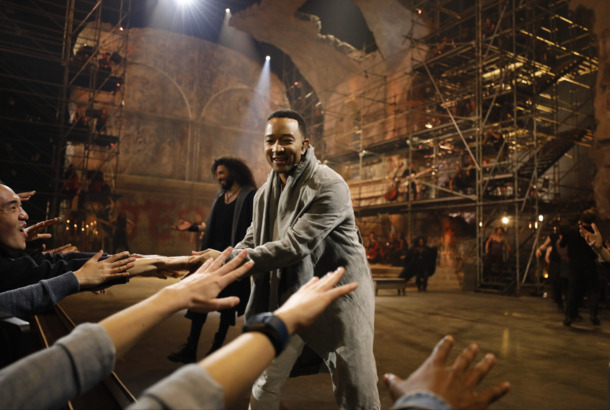 John Legend to Guest-Star As Frederick Douglass in WGN’s UndergroundHe’ll play a famous abolitionist in season two. John Legend & Stevie Wonder Lip-Synced ‘Hey Ya’They shake it, shake it, shake it like a Polaroid picture. John Legend Has Best Burn for Kaepernick HatersThe tweet to end all tweets. John Legend Developing Black Wall Street SeriesFrom the people who brought you Underground.